So there maybe a slight theme to my life lately. WoeIsME has been running rampant. I may have a day or so of relief and then its back to the gloom. But once again CraftyME to the rescue... by way of my old boss. Now this is a man who was wowed by the fact that I made an apple cozy and who loves to tease me on all of my CraftyME expertise. After reading a couple of WoeIsME's Facebook statuses, he made the following comment... Why don't you make a banana cozy to cheer yourself up? Yep it's a tampon cozy! Dude you gotta get your kicks wherever you can get em! I do have to say though. 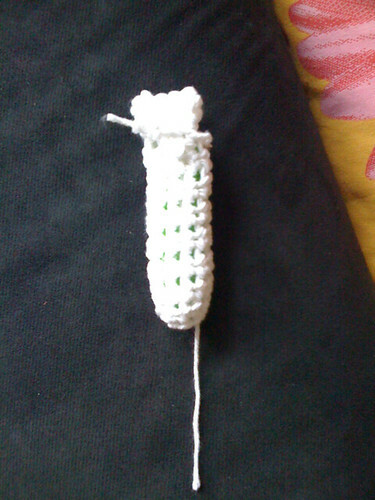 Crocheted tampons changed my life. Wait Wait let me explain. Not like that. A few years ago I used to only crochet. And I used to visit this one gossippy message board. Well one day someone posted a picture of some crocheted tampons that they found online. Well that led me to discover Craftster.org. Which in turn led me to discover OnlineCrackSpot aka Ravelry.com. So if it wasn't for reusable tampons I wouldn't be the CraftyME, blogging, onedaypodcasting ME that you all know and love.